UPDATE: Thank you to all those who came to visit the Show and also our Open Studio Event. Come and visit us at our Summer Open Studio 2013 which starts with a Private View at 5pm on 16 May until 19 May 2013. We are also going to be part of Clerkenwell Design Week and are looking forward to seeing the thousands of people that enter our doors during that weekend to come and see the cutting edge of Paper Cut Art in Europe today. 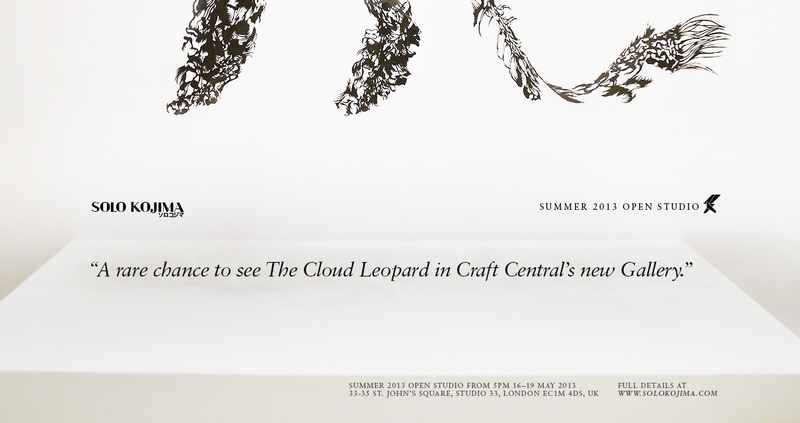 We have also been invited to show our groundbreaking Cloud Leopard Paper Cut Sculpture in the new Craft Central Gallery, one year on after it was unveiled at the Saatchi Gallery in Collect 2012. The Leopard was especially flown from Paris to London as an additional stop in his European Tour currently under way. This is a very rare opportunity to see the piece which represents a new genre of Contemporary Paper Cut Sculpture in the world today. The Show of the Cloud Leopard runs from 2–23 May 2013, 11-5pm weekdays (Open Studio hours from 16-19 May 2013). Date: Thursday 16 May: 5pm – 8pm; Friday 17 May: 12 – 8pm; Sat 18 / Sun 19 May: 12 – 5pm.